Iowa Lottery CEO Matt Strawn. The Iowa Lottery is planning on giving away the one million dollar Powerball prize that went unclaimed when the ticket expired last week. The ticket had been purchased in Nevada, and Iowa Lottery CEO Matt Strawn says they did all they could to find the winner, and now will move ahead. 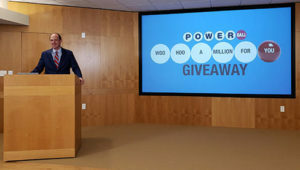 “Iowans know that the Iowa Lottery has been saying for years that money that comes from lottery prizes that expire without being claimed goes into our prize pool and promotion pool for future games. This unclaimed million-dollar prize gives us here at the Iowa Lottery to do just that,” Strawn says. He says they wanted to stick with origin of the prize to try again to give it away. “Because this story began with Powerball in Iowa –this story is going to end with Powerball in Iowa. And end with one Iowa Powerball player winning one million dollars,” according to Strawn. He says later this spring they will hold a promotion called “Woo Hoo A Million For You Giveaway” worth one million dollars. Woo Hoo is the Iowa Lottery’s catch phrase. He says you can enter by buying a Powerball play during a three-week period. “Each Powerball ticket entered will count as one entry into the promotion, no matter the purchase price of the ticket,” Strawn says. The prize period to enter is May 29th through June 18th — with the drawing for the one million dollar winner on June 19th. The original ticket was purchased at a Casey’s in Nevada and Strawn says they believe it is the first time ever that a one-million-dollar prize went unclaimed. The Casey’s store received a$1,000 bonus from the lottery for selling the original ticket, even though it went unclaimed.